TVs blare in restaurants, coffee shops and at home in the living room. Music fills the car. Emails shout for attention at work. The kids shout for attention at home. Something always fills up quiet spaces. Noise stirs up our thoughts like the waves of the ocean stir up the water on the shore. Constant moving. Swirling. Rarely a chance to settle. Rarely a chance to hear what’s going on inside. We’re so accustomed to noise that we feel uncomfortable when there isn’t any. So, we turn the volume up. If silence sneaks up on us, we mute it quickly. Social media is the perfect quick fix. It’s loud, even though it doesn’t have volume. Facebook, Instagram, Snapchat or Pinterest–they provide constant distraction for those moments waiting in line, waiting for an appointment or waiting for the waiter. It’s all noise that keeps the waters swirling. The problem is, noise keeps us so stirred up that our thoughts never settle. We don’t hear what’s happening on the inside—that’s probably why we like it so much. It’s in silence that we hear the quiet sighs of the soul, its longings, desires and fears. 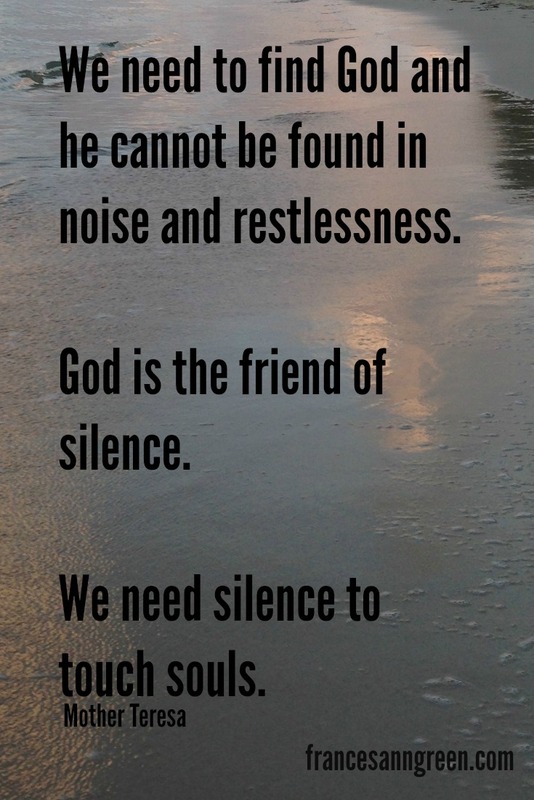 It’s in silence that we hear the whispers of God through his word and the nudging of His Spirit. It’s in silence that we find real rest. Turning the noise down gives rest to the soul like closing the eyelids gives rest to the eyes. Even a blink of silence can be refreshing. 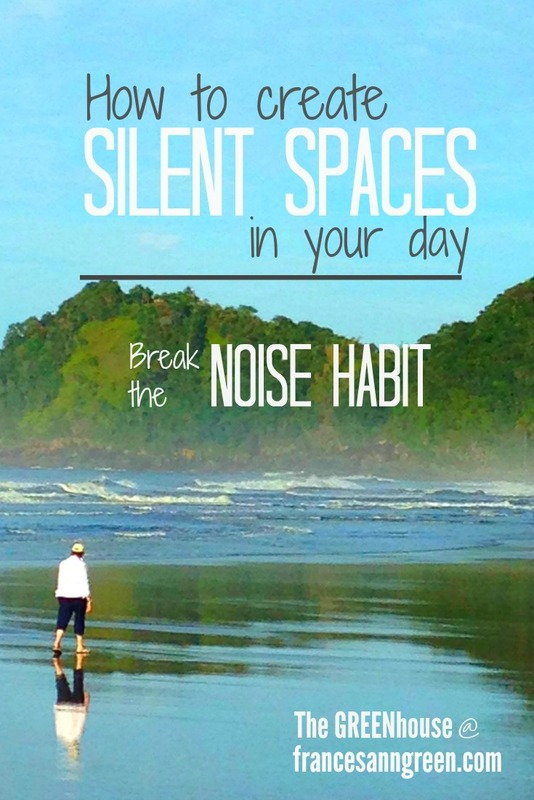 So instead of turning up the volume to fill up the quiet spaces, why not turn down the noise in your day. 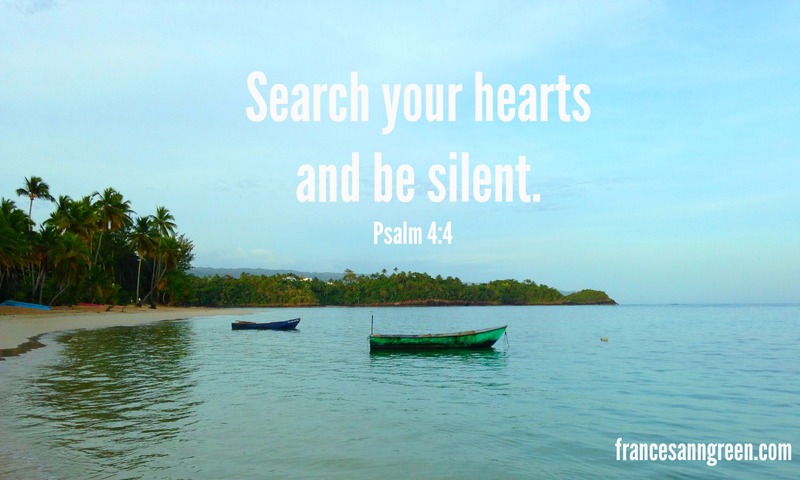 Here are some strategies for silence that have worked for me. Maybe they’ll give you some ideas to create silent spaces in your daily rhythm. Turn off the TV. Better yet, don’t even turn it on. Wake up earlier. I know it’s hard, but I’ve often enjoyed the best silence while others sleep. When we had younger kids in the house, the quiet before their noise and demands was key to my survival. Put limits on social media. When there’s a quiet space—whether it’s in the morning, waiting in a line or at the end of a long day, resist the reflex to fill it with social media. Next time, instead of scrolling, choose silence first. Enjoy silence in the car before you turn on the radio or plug in some music. Schedule meetings with a little buffer time. Arrive 10 minutes early and sit in silence while you wait. For parents with littles, when your kids are still and quiet taking a nap, you enjoy some quiet too. Save the tasks for later. Find activities that quiet your mind. Walking works for me; running works for others (try it without the earplugs). Gardening, golf, painting or writing. Explore your favorite activities that create quiet spaces. Get to work early. I recently read about a company that has their employees arrive at 8:30, but no office productivity until 9:00 in order to begin their day with quiet. Lunch break – let it really be a break that you don’t fill up with constant rushing, tasks and noise. These are just a few ideas to create silence in our noisy world. What are some ways that work for you? Let’s break the noisy habit. Seek niches of silence in the normal rhythm of your day. Your mind and soul will thank you for it.